We all know that amicable break-ups are a pipe dream, no matter what movie stars might say in front of the cameras. When a marriage breaks down, the last thing you need is the additional heartache of a hefty lawyer’s bill. It’s already horrible enough to deal with all that acrimony. In a contested divorce, after taking into account legal fees, auditors, court fees and alternative dispute resolution, it’s entirely possible to come out of your divorce in debt. So how can you save money when going through a divorce in Singapore? Don’t worry, we’ve got you covered. Here are some of our favourite tips on facilitating a cheaper divorce. 1) Settle the divorce on your own. In Singapore, it’s entirely possible to handle the divorce on your own. If you can afford the time to study the legal procedures and processes, this can be one option to consider, and it’s more feasible if you and your spouse are planning on having an uncontested divorce. However, do note that these procedures are fairly tedious and will require some time for you to be familiar with them. You can obtain more information on these procedures from the Singapore Family Justice Courts but please note that the Family Justice Courts will not provide legal advice or assist in drafting the contents of any of the required divorce documents. If your divorce is a contested one, it is still possible to handle it on your own but we highly advise you to hire a competent divorce lawyer to represent you. 2) Hire a divorce lawyer that’s value for money. Prices for legal divorce work have been slowly falling throughout the years. Whether it’s due to the much-ballyhooed oversupply of new lawyers in Singapore or a general downward pressure on legal costs is anyone’s guess but it’s good news for all potential divorcees. While prices vary, divorce lawyers in Singapore charge anywhere from $1,000 to $5,000 to handle an uncontested divorce. 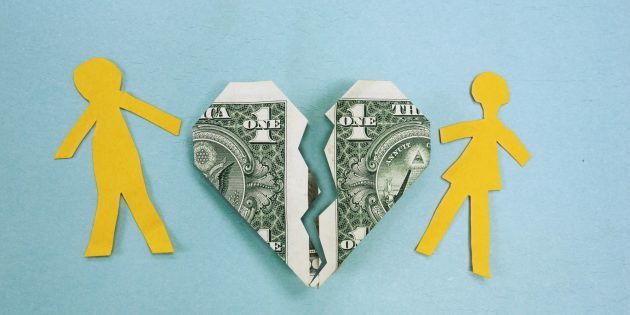 Legal fees for contested divorces can go much higher and if multiple applications are taken out, it’s not unreasonable to see bills of S$30,000 and above for a contested divorce. This is one of the reasons we emphasize choosing an uncontested divorce if the situation is appropriate. As a consumer, it’s always a good idea to find a divorce lawyer that charges reasonable rates and that you get along with. It’s also important to find out exactly how much you’ll be paying from the start. Some law firms quote a lower base rate and tack on additional charges after you sign up. Always try and get as much information as you can about the total amount you’ll end up paying, particularly for uncontested divorces. Many lawyers and law firms will offer fixed fees for simple, uncontested divorces. 3) Settle the facts of the divorce quickly. There are a number of facts that be relied upon to show that a marriage has broken down irretrievably. However, couples often quibble over how their marriage broke down, with each party sometimes insistent on “proving” that it was the other party that “caused” the divorce to happen. While this usually stems from emotion, a popular misconception is that showing that your spouse was the one at fault can get you better terms of divorce from the Singapore Courts. For the most part, this isn’t the case, and contesting the divorce itself will usually just prolong the divorce process and the legal fees that you’ll have to pay. The more important battles will be fought over the ancillary matters and this should be what you should conserve your energy and money for (if necessary). Divorce is an unpleasant experience for the parties involved and the emotional hurt can lead to the parties doing illogical things. Where possible, always try and go for an uncontested divorce. The saying “Give and take” is a useful one to keep in mind when you’re discussing with your spouse how you wish to settle the aftermath of the divorce. Even if you end up contesting certain things, be it the actual divorce and/or the ancillaries, it is a good idea to try and resolve things during mediation at the Singapore Courts. The Family Justice Courts are strong advocates of mediation as an alternative dispute resolution mechanism for divorce and you can save a lot of heartache and money if you settle your divorce at the mediation stage. 5) Be reasonable when trying to come to a consensus on the matrimonial property and assets. There’s that saying again. Be reasonable when trying to come to a consensus on the division of matrimonial property and assets. Oftentimes, parties can have ridiculous expectations when it comes to how the assets of the marriage will be divided. This is where a strong understanding of the law on the division of matrimonial assets comes in handy. 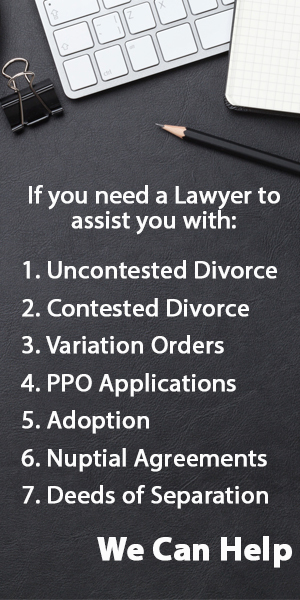 A good, objective, divorce lawyer will be able to give you a rough idea on how assets will be divided. Generally, if both parties are reasonable, this financial aspect can be settled without having to go to Court. There’s also no need to squabble over things that aren’t really that important to you. This may sound obvious but it happens frequently in divorce. It’s all too easy to be vindictive but resist the urge. If your spouse really wants something and it’s something you don’t really care for, just let it go. 6) Think about your children. No, really think about your children. Unless there are very strong reasons otherwise, joint custody is the norm in Singapore. Care and control of the children is usually one of the bigger issues to consider during a divorce and an area which is frequently contested. Take some time to think through this logically. Think through whether your work and living situation will be appropriate to take care of your children’s day-to-day needs. Discuss with your spouse the realities of the future living situation and whether it’s possible to come to an arrangement where the able party lives with the children while the other spouse has generous access to the children. The law in Singapore states that the welfare of the children is the paramount consideration when considering issues of custody and care and control but parents shouldn’t need the law to tell them that. If you truly want the best for your children, leave the anger behind and make a rational decision together with your spouse. If both sides remain logical and willing to compromise, you’ll find that there usually won’t be any need to settle these issues in a Singapore Court.